Refresh your body with a deliciously light cocktail of Coconut Fruit Extract and Honey. 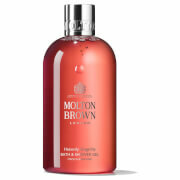 An understated, delicate fragrance, Molton Brown's mild formula gently cleanses and conditions your skin to leave it feeling soft, smooth and supple. Gently cleanses skin, leaving it soft and moisturized. 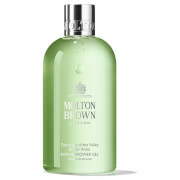 Can be used as a shower gel or bubble bath. For bathing, pour 25-30mls under a running tap. Lie back, luxuriate and relax in the enriched foam. In the shower, apply 5-10mls to a sponge or washcloth and smooth over the body, massaging towards the heart to boost circulation. Water (Aqua), Sodium Laureth Sulfate, Laureth-4, Fragrance (Parfum), Cocos Nucifera (Coconut) Fruit Extract, Hydroxypropyltrimonium Honey, Peg-18 Glyceryl Oleate/Cocoate, Ppg-26-Buteth-26, Peg-40 Hydrogenated Castor Oil, Butyl Methoxydibenzoylmethane, Ethylhexyl Methoxycinnamate, Ethylhexyl Salicylate, Alpha-Isomethyl Ionone, Benzyl Salicylate, Sodium Phytate, Propylene Glycol, Sodium Benzoate, Potassium Sorbate, Sorbic Acid, Phenoxyethanol, Methylisothiazolinone, Citric Acid, Sodium Chloride. 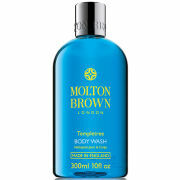 I received a sample of this shower gel and fell in love with it. It smells great, not overpowering. It is also gentle on my sensitive skin. Nothing else I've used comes even close to this great product.